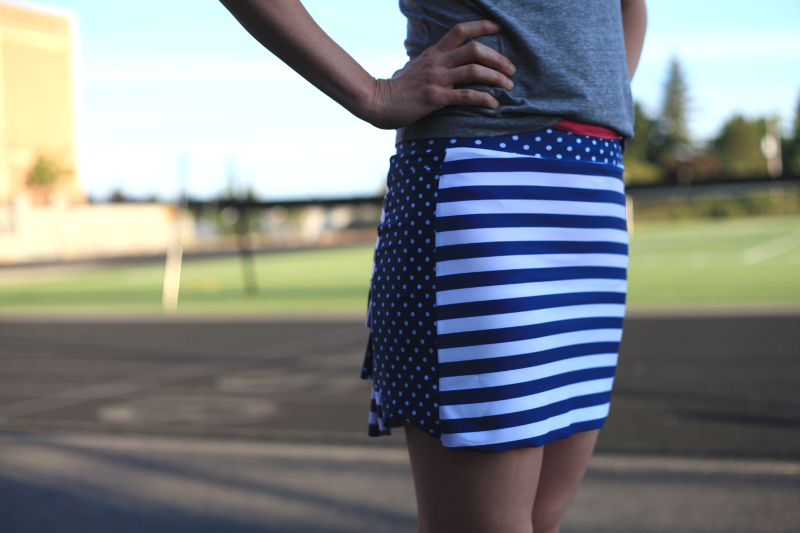 I recently got inspired to make a million running skirts. And by a million, I mean five. But, making five felt like a million because assembly line sewing means even when you’re on the next to last step, you still have so much left to do! Especially when deconstructing a ready-to-wear waistband pocket modification is your next to last step! 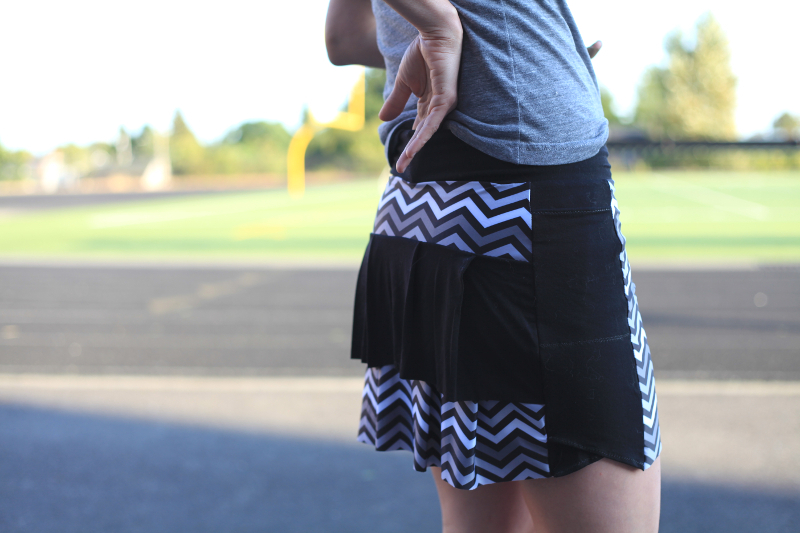 My running skirt pattern of choice is Jalie 2796. I’ve made it twice before already. The first time I made it up exactly as prescribed. The second time I went up a size, chose the view with the wider waistband, and added ruffles to the back since I kind of felt like I was wearing a college party skirt instead of a running skirt whenever I pulled on my first version. This time I decided to take the skirts up another notch by adding pockets to the waistband. I was inspired by my favorite ready-to-wear Lululemon capri tights, which have two little pockets hidden in the front of the waistband and a large zippered pocket in the back. I couldn’t be bothered to add a zipper to all five of the running skirts I was making, so my version has the two pockets in the front and a large non-zippered pocket in the back. The key to this technique is the fact that the waistband is just a wide band of jersey. 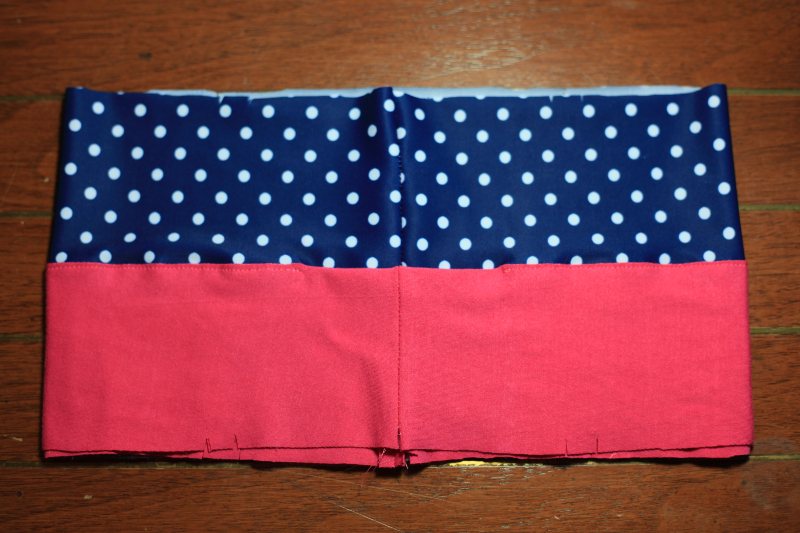 If you double up on the bands and stitch in just the right places, then you magically make pockets! And, since there are many patterns out there that use a large rectangle of jersey for a waistband, I figured some of you might be interested to know how to add your own pockets to your own knit waistband patterns. Okay, so first off, you need to cut two waistbands. The waistband on the Jalie pattern is just a simple rectangle with notches in the appropriate places. 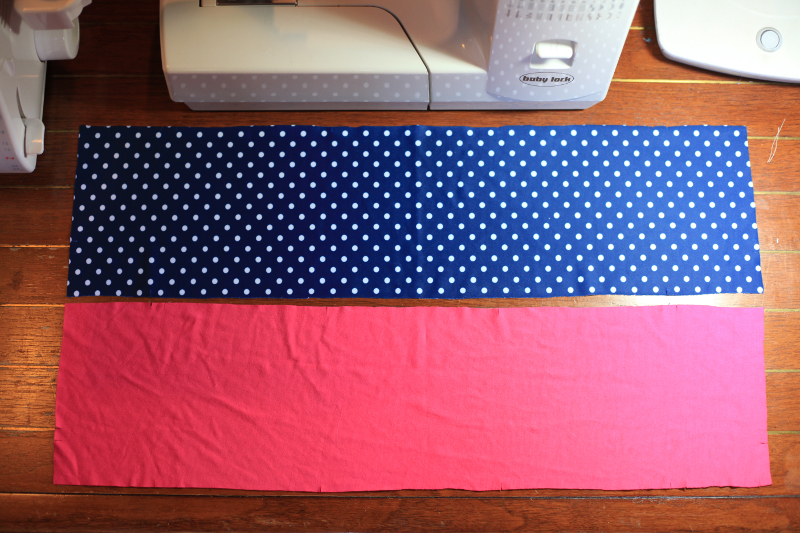 I’ve cut one in fashion fabric (the blue polkadot, which came from Funkifabrics) and one in a thin bamboo jersey (the pink, which came from Mood Fabrics). Because you’re adding bulk by adding a second waistband, you want the extra waistband to be as thin as possible while still having the same properties as the fashion fabric. Stitch the short ends together, just as you typically would. 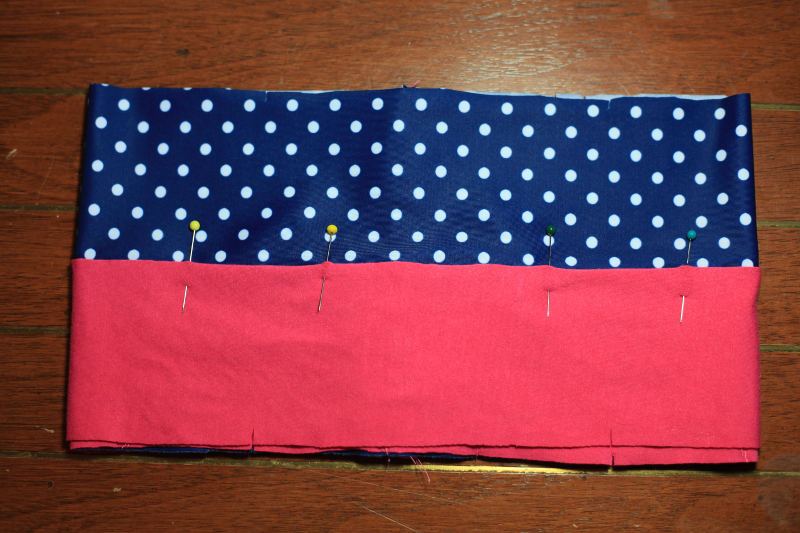 Place the extra waistband inside the main waistband, right sides together. Double check that the right sides really are together by confirming that the seam allowances are both facing out! Align all the notches and either baste or pin the two together. 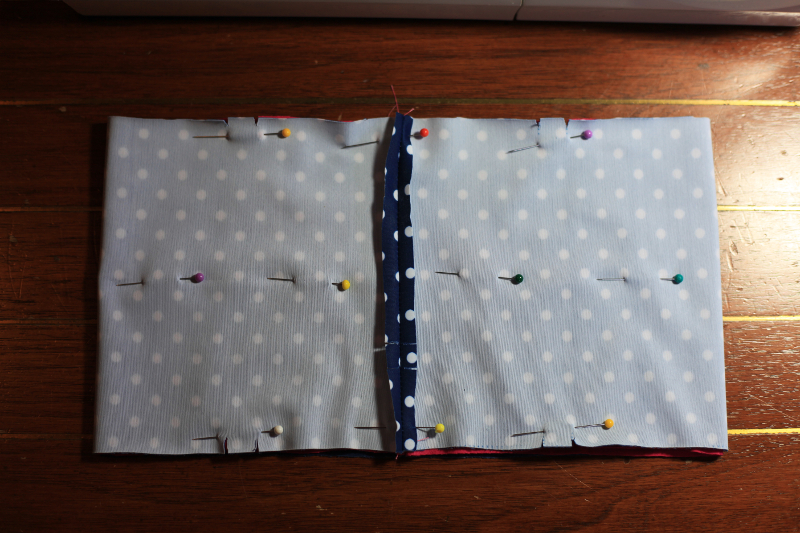 Here, I’ve just pinned at the seams and all of the notches. 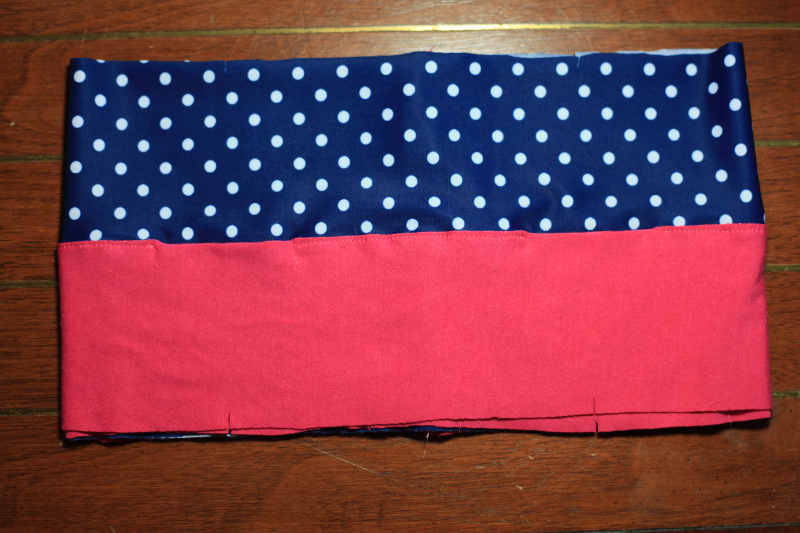 Fold the waistband sandwich in half, just as it will be when it is sewn to the garment, to find the midline. Press to form a crease. Baste or pin along the crease to keep the two waistbands together. Here, I’ve pinned at intervals. Now it’s time to mark your pocket openings. 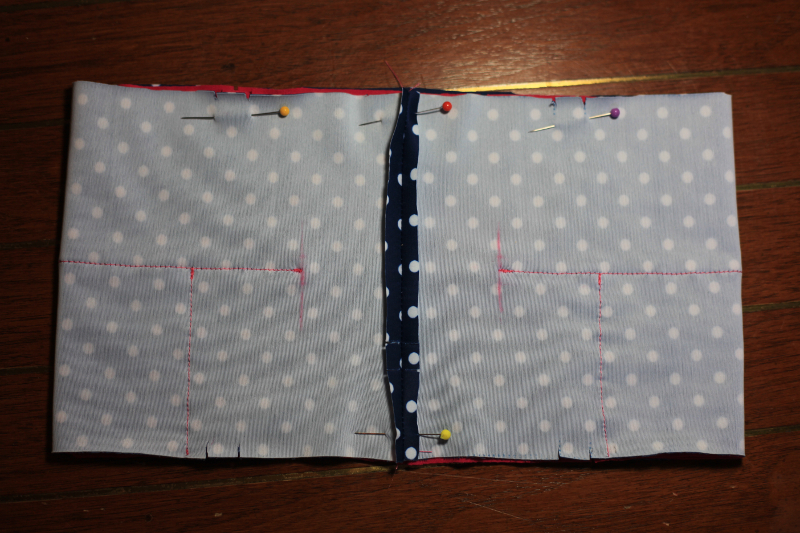 I wanted two pockets in the front, which I centered around the front notches in the Jalie pattern. 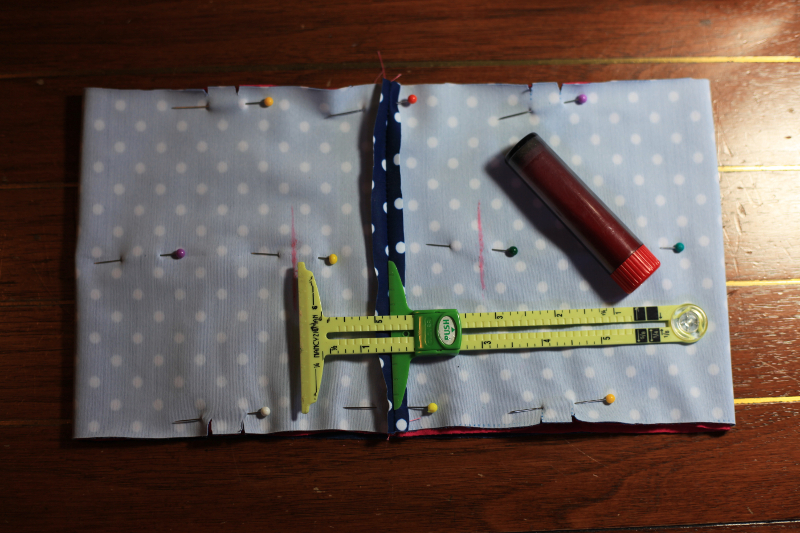 I made the opening 2″ wide using this sliding ruler, thinking that that would be a good size for pulling snacks out of them during a long run. I wanted one pocket in the back, which I centered around the center back seam. 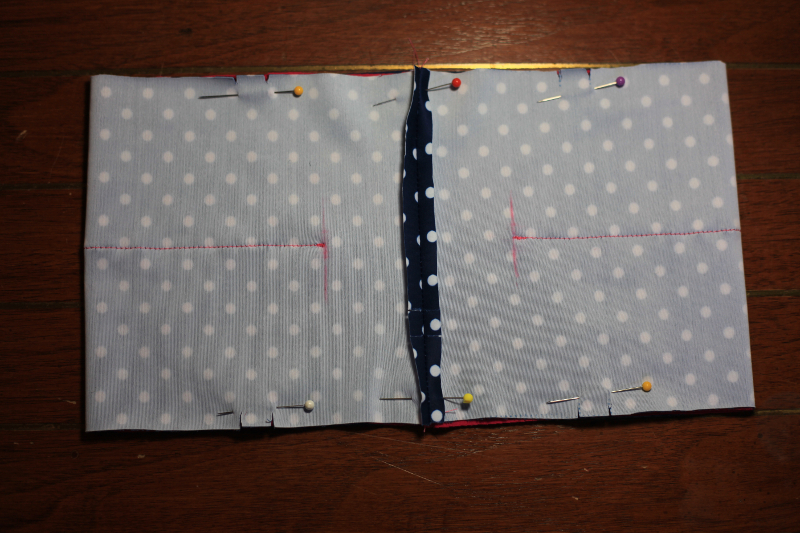 I made the opening 3″ wide so that I could maybe fit a phone in there during my run (still to be determined!). You are welcome to dream up whatever kind of pockets might work for you during this step. Have fun and try out different combinations! I marked the edges of the pocket openings with a red Clover Chaco Liner. 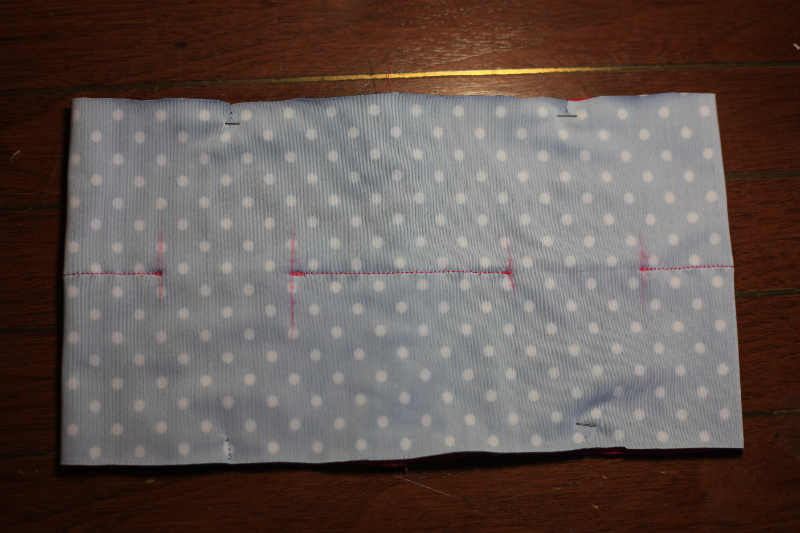 Stitch along the crease marking the midline but only between the pocket openings you marked. Do not stitch over the pocket openings! 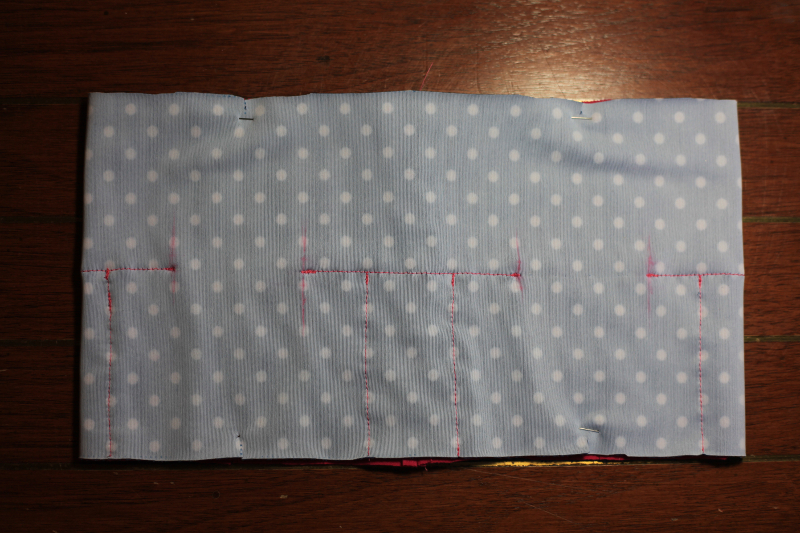 Make sure to reinforce the ends of your stitching lines to prevent the seams from ripping as you use your pockets. Now it’s time to sew the side of the pockets. Stitch up from one side seam to the already sewn midline on the side of each pocket opening. I stitched about an inch away from the ends of the openings for each of the front pockets and about an inch and a half away from the ends of the opening for the back pocket. Can you see how the stitching has formed three pocket on the bottom half of the waistband in the two images above? Again, whatever width you choose here is fine. In fact, I kind of wish I’d added a little opening to that space in the center front since it would be perfect pocket for a single key. Now it’s time to under stitch! Turn the waistband right side out, and separate the single layer that will make up the front of the waistband from everything else. 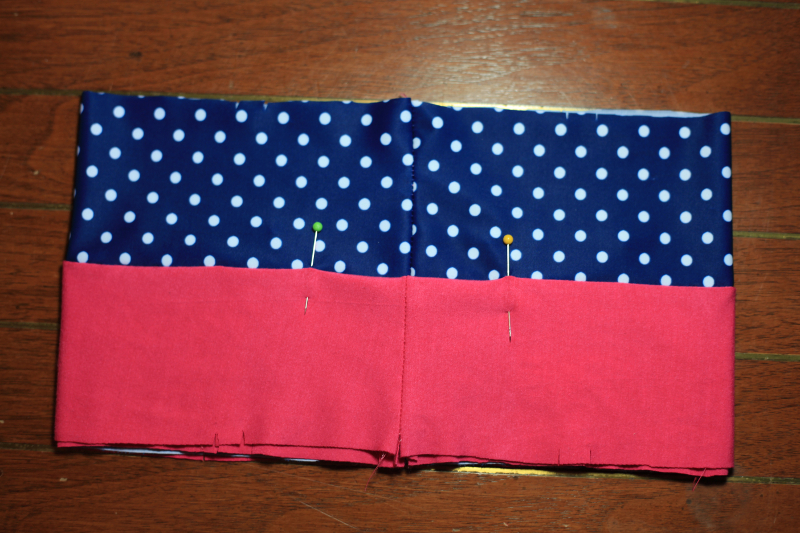 Mark the ends of the pocket openings with pins since you don’t want to under stitch over them. Under stitch through every layer but the single layer that will make up the front of the waistband. I’ve used pink thread here, which was easy to see against the white back of the polkadot but hard to see against the pink. Hopefully you can kind of make out the glow of the stitches. 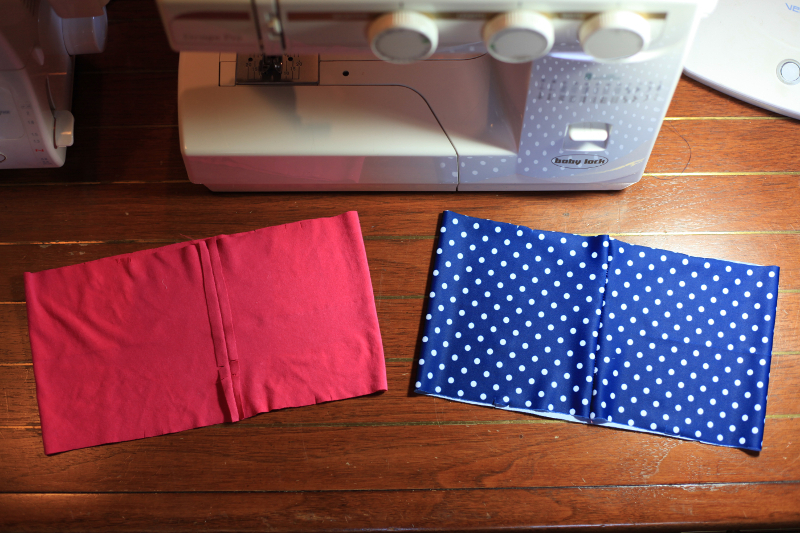 Fold the waistband in half, and you’re finished! The waistband is now ready to stitch onto your garment, just as you typically would. One note – I did not account for the turn of cloth for simplicity, which is why the bottom edges don’t meet. It’s a good idea to baste all of the waistband layers together before stitching them to your garment to make up for the difference in the turn of cloth. You wouldn’t want to forget, line up all of the edges, stitch your waistband onto your garment, only to see a bunch of weird puckers. Basting also helps to make sure you catch all of the layers when you stitch your waistband onto your garment, especially if you’re planning on using a serger for the seam. There’s nothing worse than having to unpick a merged seam for a loose raw edge of fabric! Well, maybe there are plenty of things that are actually worse than that, but you know what I mean! 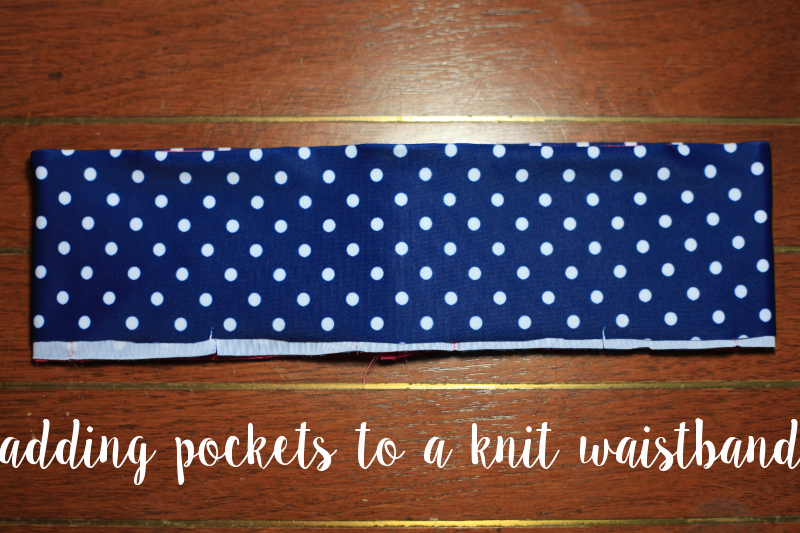 Let me know if you use this tutorial or if you have your own preferred method for adding extra pockets into stretchy waistbands like this! I’m not sure if the waistband is too high, if it needs some sort of interfacing, or what? I guess that’s what I get for getting so excited and writing a tutorial without first fully testing out my methods! You have a great talent, Amy. Your instructions are clear and easily understandable. Thank you for sharing your knowledge. Thank you so much, Cecilia! You have no idea how much that means to me! Great tutorial! i love little pockets, you have me thinking…. re: waistband flop. 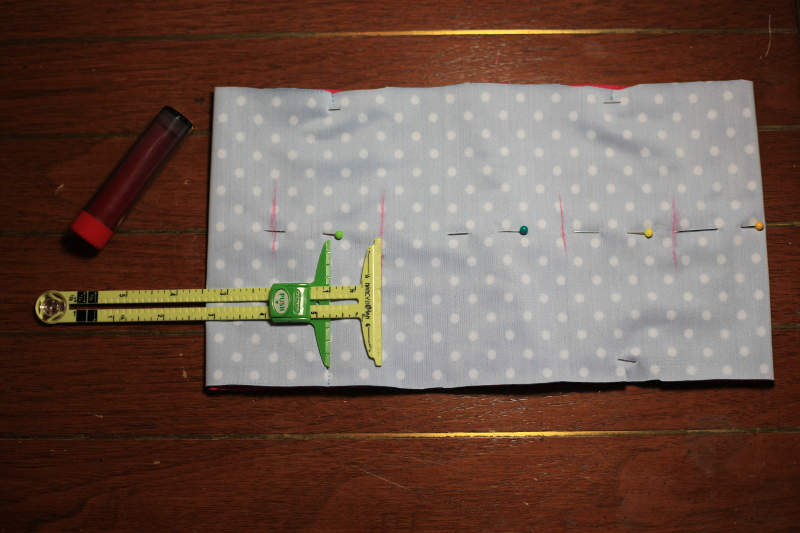 you could insert a couple of plastic bones, and it would be dead simple to create channels for them right next to the pocket seams as you’re sewing the waistband. 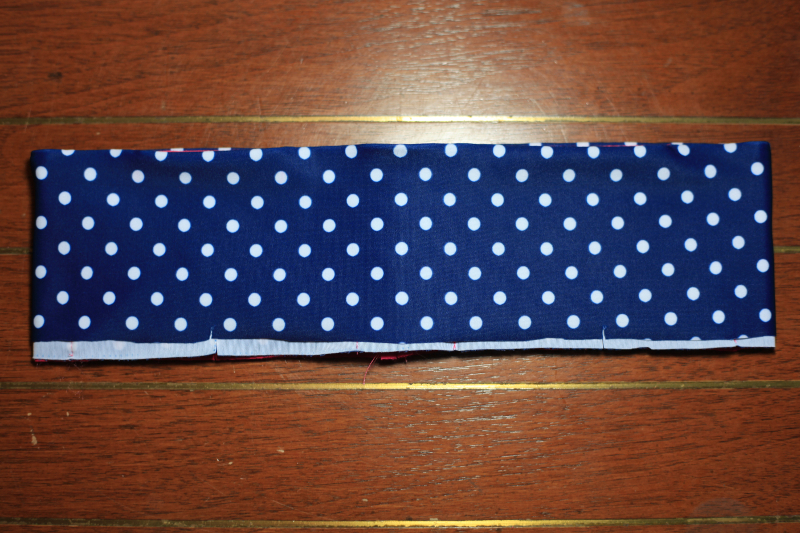 I plan to insert elastic to keep the waistband sturdy, but I haven’t completed it yet. This tutorial is ingenious! My last attempt at waistband pockets was weak. I will let you know how the elastic turns out. Just what I was looking for! Needed some pockets in my leggings for house keys and phone whilst running! Thank-you!!! I have a great pair of running capris that have a wide waist band. I was wondering how I could utilize that space in the front waist band to create a pocket. Any advice on this? Thank you! Hi Jurlene! Sorry to not get back to you sooner. I haven’t been able to make much time for this blog lately. I’m not sure what advice I would give. The pockets I made work, but not as well as I’d hoped. Whenever I can get back into sewing, I hope to do some more research on pockets in legging patterns and in ready-to-wear leggings to see if there’s something out there I can try next.